Fresh Beauty has done it again. I am already a huge fan of their skincare and lip balms. Now my friends I bring to you their rose garden. Ok.. ok…not technically a rose garden but pretty darn close! They have a perfume that smells like a beautiful rose garden but not over powering where you feel like you have to faint (I’ve experienced rose scented perfumes that made me dizzy). This one smells so fresh and gives off those romantic vibes. A little fyi about the ingredients : Alcohol, Parfum (Fragrance), Aqua (Water), Tocopherol, Ethylhexyl Methoxycinnamate, Butyl Methoxydibenzoylmethane, Ethylhexyl Salicylate, BHT, Hydroxycitronellal, Linalool, Citronellol, Geraniol, Farnesol, Eugenol, Citral, Limonene. I received this beautiful package by the Fresh Beauty team and was so excited to unbox it. It came with the 30ml beautiful scented rose morning eau de parfum , the roller ball 10 ml rose morning eau de parfum, 100 ml Rose deep hydration toner, and a 60 ml Rose floral toner. The Rose deep hydration facial toner I have used before and love it. It has petals inside! Pretty neat if you ask me! 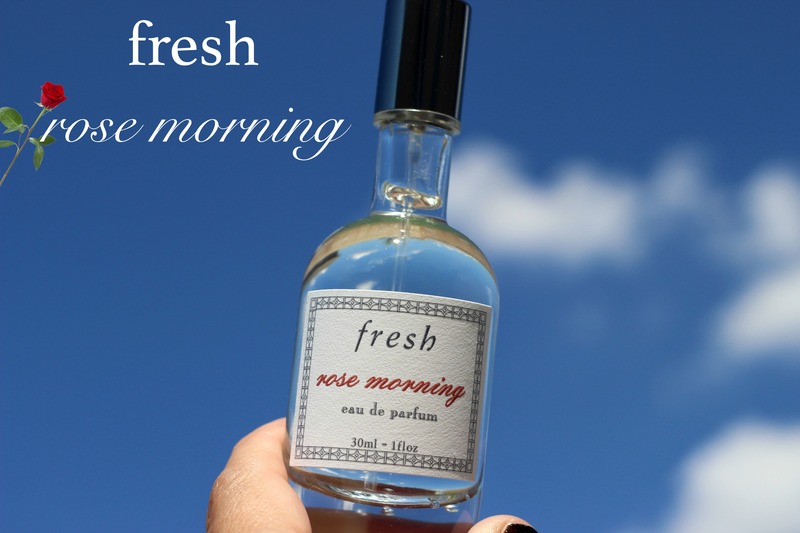 I never tried out the Rose Floral toner so I thought I would give it a try and review that as well since you are here anyways and we are on the subject of Fresh Beauty..ya know! So the first thing I noticed was it was a spray. I thought that was pretty cool and you can spritz directly on your face but I wanted to spray it on a cotton pad and then gently wipe on my “WHAT I THOUGHT WAS A CLEAN FACE” lol and this picked up that yucky dirt that was apparently stuck to my face. This is alcohol free with a very gentle scent of rose. I take it with me in my purse now and spray here and there. It’s a must-have. Another one I keep in my purse is the roller ball! I don’t really need to touch up with this but it’s always good to have just in case. (I am a mom so I am constantly running around). If you were to ask me if this was a day or night scent I would say both. I have used it in the early morning because.. duh “rose MORNING” just made sense. haha..and like I said before it gives romantic vibes so night time makes sense as well. Question for you? Have you tried the Cannabis Rose Eau de parfum? I really want to try that next! If you want to try any of these out you can go directly to fresh’s website ,sephora or nordstrom. Or easier you can click the images below. Thanks for reading! (READING IS GOOD FOR YOU. SO COME BACK!) hehe.